Enjoy breathtaking unparalleled open-water Gulf of Mexico views and boat dock in this grandiose custom estate located on Indian Bluff Island, one of Palm Harbor Florida's premier waterfront communities. As you step into this stunning one-of-a-kind 3434 sqft estate you are greeted by a glossy wood and wrought iron staircase including access to the recently refinished pool with entertainment deck. 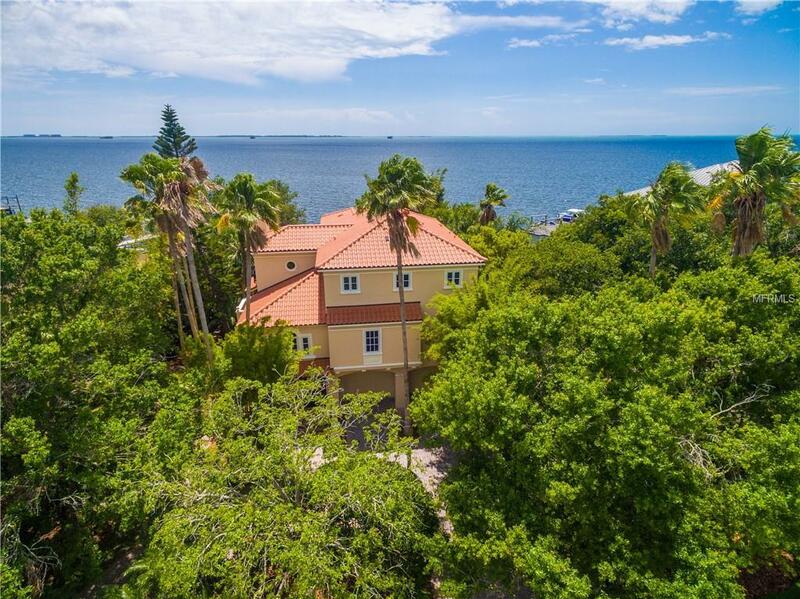 This home boasts an open living area with fireplace, beamed ceilings, double pane tinted, insulated glass in all windows and doors that open to tiled floor screened balcony overlooking the water. Enjoy the cozy parlor with v-groove wood cathedral ceilings, porcelain tile floors. Natural gas cooktop, double oven, walk-in pantry and eat-in kitchen combined with the formal dining room is an entertainers delight. Second floor bedrooms share a jack-n-jill full bath. The entire 3rd-floor is the master suite with private screened veranda which boast spectacular views of the ocean, his/her baths, jetted tub and shared shower, walk-in his/her closets, laundry and a perfect den retreat. The walled backyard has a double gate for boat/trailer access, privacy prevails. Lush tropical bamboo garden, circular paver drive, 2-car garage with workshop, reclaimed water, security system, a new $21,000.00 main floor air conditioning system, exterior recently painted, 3-year new 30 year clay tile roof with transferable warranty, concrete foundation with pre-stressed concrete piling driven down to the rock. Truly a waterfront gem. Pet Restrictions County Pet Restrictions Apply.